Our town got hit with tornadoes today. Our neighborhood was one of the ones hit. We were lucky to be staying in the basement/garage at a friend's house. I didn't even hear it hit. We had 8 kids and I'm not sure how many adults in a bathroom. Bob's ears popped. We opened her garage door when it was over, and we were shocked! Trees were down all over our neighborhood. Once he felt it was safe enough, Bob ran to our house to check it, and see about our neighbors. Most of our trees are gone, including the biggest one. It hit the playroom roof, but Bob climbed into the attic, and there's no water in there right now. Some of our neighbors had damage like us, but others had much more damage. Everyone was ok, though. Less than a mile from our neighborhood, parts of the town were pretty much leveled. I've only seen pictures, but it looks bad. My dad and grandmother went to her church for the storm. My dad's glasses were blown off of his face right as he got into the building. Every car in that parking lot was hit with a tree. My grandmother's car was only dinged. My dad's truck was pretty damaged. Our church was damaged, but a church across the street from it was destroyed. A huge, historic home next door to that building had it's roof completely torn off. That home backs up to our neighborhood. Our house is without power, so we're staying with my dad. We had to walk to get to my dad. There was so much destroyed, and so many roads were shut down. It was very surreal looking at all of the damage while we were walking on a normally busy road. Luckily, we are all ok. It was a rainy, gray day. We spent most of it inside. But we did venture out this afternoon. I should have taken a picture of Little Elvis. He wore a yellow t-shirt with snakes, bright blue gym shorts, black socks pulled up to his knees and tennis shoes. He topped off this ensemble with a red wrist sports thingy. I think tennis players used to wear them. It was quite the outfit. He was proud of himself, as was his daddy. Bob delights in their oddball fashion sense. Baby Plum decided to wear dark brown socks with his sandals for a couple of weeks ago. I nixed that little plan, because I think he was going to school. Bob says he would wear socks with sandals if I didn't stop him. A few weeks ago, he wore 2 completely different shoes to work. None of his students told him. I told him I bet they noticed. Little Elvis on the same morning. Why did I take his picture? Because he's got his underwear pulled up way over the waistband of his pants. He just bunches everything up at his waist. It seems so uncomfortable to me, but it doesn't bother him at all. I dressed them this day. More and more, I hear about how alike my two oldest look. So, I dressed them alike one day. Baby Plum loves to be told he looks like Little Elvis. Cheese Puff doesn't have a Hawaiian shirt at the moment, so I just put him a blue striped shirt. He was obviously not happy that he didn't match his very stylish older brothers. I've been kind of lazy about getting on the computer this week. Here are some pictures from the past two weeks. Baby Plum decided that he wanted to play Daddy's violin the other day. I think the bow needs something. Maybe a haircut? We tried holding it the correct way. It was hard. He has a toy-sized version of just about every instrument. But not a violin. Of course, that's what he says he wants. Cheese Puff hamming it up for the camera. His hair has almost grown out from my botched haircut. We still haven't had his two year old picture made. I'm waiting for the hair to get better. The other day, all three boys were happily sitting in the fort. I had to take a picture before the sweetness ended. It ended while I was getting the camera, so I made them pretend to still be happy. They did for two pictures. It's been a long week for our family. 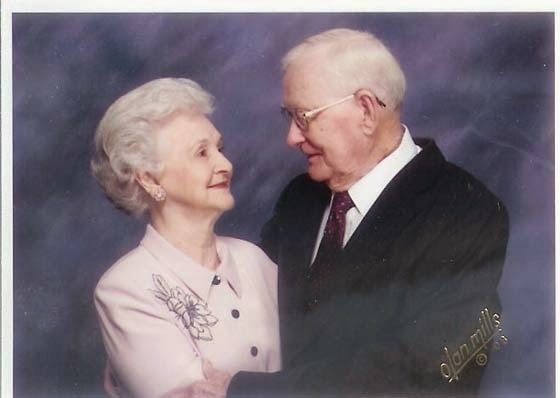 My grandfather, Pappy, died on Monday night. He'd been battling Alzheimer's for about 12 years. This is Pappy a few years ago. 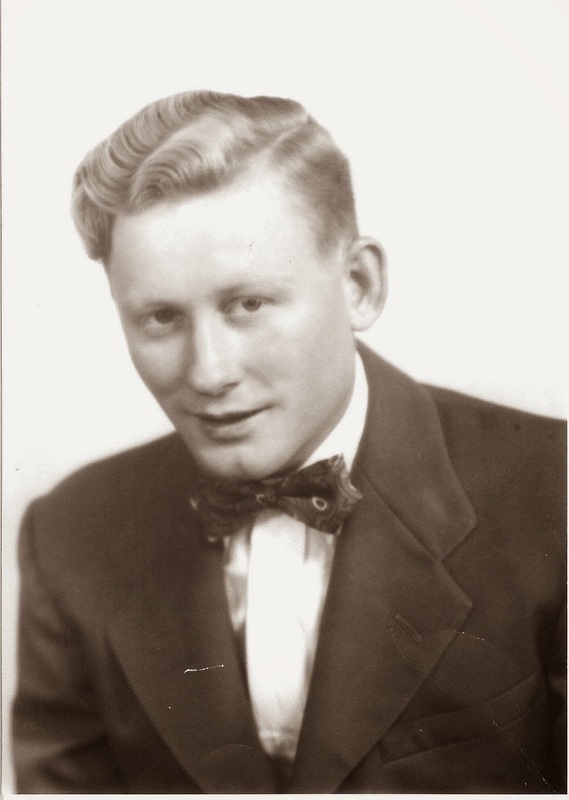 This is Pappy as a young man. My grandmother brought this picture to his funeral, and everyone commented on how handsome he was. My aunt told me that my grandmother loved his chin dimple. He looks kind of like a movie star. My grandmother had these pictures made a few years ago. I love this one. I have it framed in our living room. See the love? 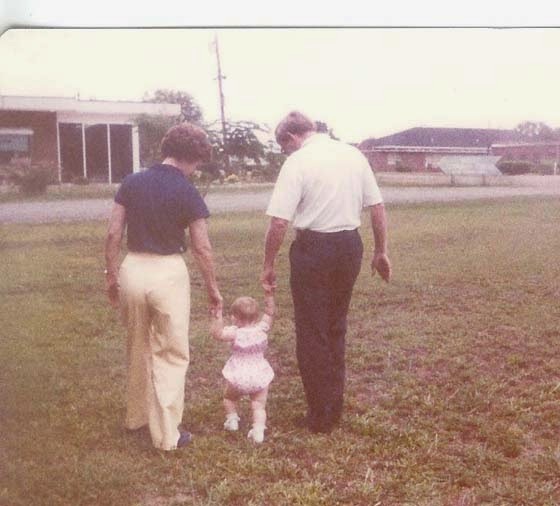 This is Granny and Pappy with a baby me. He was a wonderful grandfather. He loved games, and maybe I got my love of them from him. He was also a good man. A lot of people told us that at his visitation. He was. Bob never got to really know him. I don't believe he had been diagnosed when we got married, but it was obvious that something was wrong. I think Bob would have really liked my Pappy. I remember having a big debate with him once about how to pronounce salmon. I believed the "l" was silent. He didn't. Finally, Granny looked it up in the dictionary. We were both right. 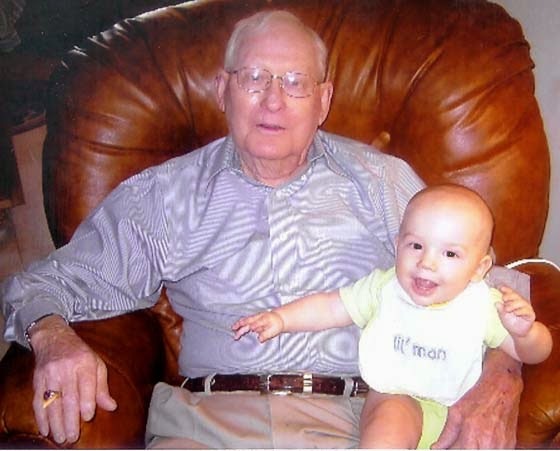 Here's Pappy with baby Little Elvis. The boys were never scared of him, and even really liked going to visit him in the nursing home the past few years. When Little Elvis was younger, they enjoyed throwing a ball back and forth. Pappy liked babies. He always wanted to hold mine, until he found out how heavy they were. Pappy also loved music and dancing. Even in the nursing home, when people came to play music, he would get up and dance... sometimes with someone else's walker. The boys did a pretty good job this week, and I was proud of them. They didn't really know their Pappy, and I hate that. I wish they had gotten the chance. Cheese Puff is already displaying the same flair for the dramatic that his older brother has. He fell down on our sidewalk last week. I swear I soothed for an hour. Well, it sure felt like it. Once he was cleaned and bandaged -- he hates band-aids by the way -- and given juice, I rocked him and tried to sing his current favorite song, "You are my Sunshine." He wouldn't calm down, so I asked Baby Plum to come take some pictures. Sometimes posing calms him. It didn't work very well. The cats like to get in on the cheering up action when they can, so Wally offered his support from the new dresser. Baby Plum had to get his picture as well. I guess Wally's a little camera-shy. Once Cheese Puff calmed down, Baby Plum wanted his picture made holding the Q and K magnets. I now realize it would have been perfect if he'd gotten the O and K.
The nice weather has caused the boys to find new ways to spend outside. Last Friday, they decided that eating lunch in my car was the best option. So, I brought out their plates. Side view shot, where it's easier to see their faces. They enjoyed dining al fresco, and I have a feeling it will become a new Friday tradition. This time of year is always busy for the boys. They seem to know lots of people born in April. Throw in Easter and just general stuff, and today was super busy for them. We started our morning with a visit to the Easter Bunny. The older two were more than happy to pose. Cheese Puff? Not so much. He's currently afraid of the big blow up blue bunny at the grocery store. So, this bunny was definitely off limits. Little Elvis also wanted to pose with the pretty Tinkerbell. No idea why... Baby Plum? Not nearly as impressed. They spent the rest of the morning covered in glitter. Both boys got their faces painted. Little Elvis went for a bunny rabbit look with a nose and whiskers. Baby Plum picked a green smiley face. When it was done, I told him to say "Thank you." Instead he said he didn't like it, and wiped it off on his shoulder! He's been in some sort of phase for a couple of weeks. It's not fun. We followed that with a trip to a local green festival. They also had a birthday party, and the older two had a lego party. I only took pictures with the bunny. And didn't take any of Cheese Puff being held by his Daddy while he guzzled lemonade. Lemonade makes mean big bunnies tolerable. Baby Plum's at an interesting stage. He doesn't ask "Why?" But he asks other questions. Right now, he's trying to wrap his head around time. We've had several conversations about what he was like when he was a baby. Those have led to questions about what he was like when Little Elvis was a baby. I told him he wasn't here yet. I tried to explain that Little Elvis was 2 1/2 when Baby Plum was born. So he didn't know Little Elvis as a baby. He wanted to know what games Daddy and I played when we were young. I told him that I didn't meet his daddy until I was 22. We didn't know each other when we were little. He wanted to know what he would be like when he was Daddy's age. I told him I didn't know yet. We'd have to wait and see. My sweet 4-year-old had show-and-tell at school today. I talked him into taking his (brother's) shopping cart. He wanted to take a calculator and a broken car that he never plays with. I thought he should take something he legitimately liked and used. I believe most of his show-and-tells have been influenced by me -- the electric guitar, accordion, and doctor's kit. The shopping cart was bigger, though. As an afterthought, I tossed his homemade coupons in and we headed out this morning. When the lady came to get him out of the car, I told her I had to get his show-and-tell. I pulled out the cart, and he zoomed it into the school. They were all laughing. When I came to pick him up, two teachers said they loved his show-and-tell, and his teacher mentioned his coupons. She thought they were real. I told her that those are just the ones he uses when we pretend to grocery shop. I'm sure they think we are a very strange family. The weather here is beautiful! It's been great. Maybe storms at night, but during the day? The boys get to have lots of fun. Little Elvis decided to have a "Friend" party on Wednesday afternoon with his new friends in the neighborhood. He invited all of the kids he could think of, even stopping to invite a friend for Nate. I'm told he was polite. Cheese Puff? Loves it! We play in my car every morning once we get home after dropping off his brothers. We jump on the trampoline. He gets himself up, then says, "C'mon Mommy!" I, of course, don't take pictures. But my mom did this afternoon. Cheese Puff has a knee boo-boo. I seriously had to soothe a baby for an hour. He'll remember it, too. Every diaper change, or bath will dredge up the memory. He'll rub the scab and say, "Ow!" This baby also likes the outdoors, but gets overwhelmed by all of the older kids populating our formerly quiet backyard. He much prefers the company of his 2 brothers. But he was very happy to be the king of my parents' deck. I'm so happy for warm weather! After much discussion, we decided to let Little Elvis try out for the latest play in our area. It's School House Rock Jr. He already knew some of the songs, and we thought his behavior had gotten better. We also want him to have a wider net of friends. So, he got a small solo. I'm fine with that. He doesn't always need a named part. But he's had to go to practice for 5 days a week since they started rehearsals. He's in the chorus. Some nights it was just 50 minutes. Now it's at least 2 hours. It's been a lot. We're rushed every morning when he gets home from school. He has to do homework, practice baseball (and when Mommy has to do the pitching, he reminds her how she should have practiced more when she was younger, because she's not very good) eat supper, shower (because it wastes his time to shower in the morning) and then rush to practice. At first it was fine. Then, a little friend in the neighborhood started coming over. He must think it's nuts that we eat at 4:30 to 5. When he's been over, we push Little Elvis' shower to the morning. But we're still rushed and have to rush friends out of the door. Little Elvis pitched a fit last week, and the little boy hasn't been back. I'm hoping he's just busy. Today, two new kids came over to play. They are older, but very sweet and tolerant of our very excitable big boy. But he's also smart enough and well-read enough to hold his own in conversations with them. It also helps that these kids like to make movies. They loved his Super America movies, and are ready to finish our trilogy. We had to rush them out this evening, because we had to scarf down supper, so he could run to play practice. It's so nice for him to have friends in the neighborhood! While he's made friends with this play, (and possibly a little girlfriend!) we're all ready for a break. Even my poor parents probably are. They've had to pull extra sitting duty since practice nights are getting later and later. Oh, and there's dancing in this one. It's not hard, but it's so funny watching him. I'm quite certain he's not a dancer. He's trying, though. I can't wait to see the whole play!